Pawuluge Malinda Pushpakumara ~ the spinner has just played a Test before – he may like to forget playing here at Pallekele today ! There was another Pushpakumara, Ravindra who played for Lanka earlier. Have read that Farokh Engineer came agonizingly close at another Madras Test against the West Indies in 1967, nobody expected much from him as a batsman. He had made his Test debut way back in 1961 and in the intervening years he played just 11 Tests — mainly as a tailender. He had scored 3 fifties — including his then highest of 90, all at the No. 9 position. Kunderan who had made runs earlier was dropped for Engineer. WI had Wes Hall and Charlie Griffith, arguably West Indies’s greatest fast bowling combine before the advent of Andy Roberts & co. Engineer was on 57 in India’s score of 72 for no loss in 12 overs after the first hour. He was 94 from India’s total of 125 for no loss at lunch. Years later, in 2006 – Virender Sehwag came much closer on a tour that Sachin Tendulkar had opted out. The new ball was shared by S Sreesanth and Munaf Patel, with the experience of two Tests apiece. The first Test at St John’s also saw a debutant tearaway called VRV Singh. The over rate was abysmally slow and Sehwag was stranded at 99 by lunch. Sehwag got his hundred three balls after lunch, and smashed his way to a 190-ball 180. At Pallekele, Indians are on a roll. Shikhar Dhawan is scoring centuries at will. If his 190 in the first Test at Galle was not enough, Dhawan backed it up with another whirlwind innings scoring 119 on day one of the third Test in Kandy. Then there is another, who is blamed for making runs ! KL Rahul, batting on 85, was going great guns before he stepped out to left-arm spinner Malinda Pushpakumara, ended up giving a catch to mid-on. In terms of momentum, it was the cut-off point for India, as they meandered to 329 for six after that. It was the seventh consecutive half-century for Rahul, and even though he joined the likes of Everton Weekes, Andy Flower, Shivnarine Chanderpaul, Kumar Sangakkara and Chris Rogers for the most consecutive fifties, the 25-year-old would be a bit sad to find that he and Rogers are the only players to have not converted any of their seven fifties in that sequence into a hundred. Rahul's scores in this streak are 64, 90, 51, 67, 51* versus Australia at home, and 57 against Lanka after his return from illness at the SSC in Colombo. It was clear that India are not going anywhere near 600 that they had posted in first two tests and when Shami got out, it appeared that 450 was not on radar. 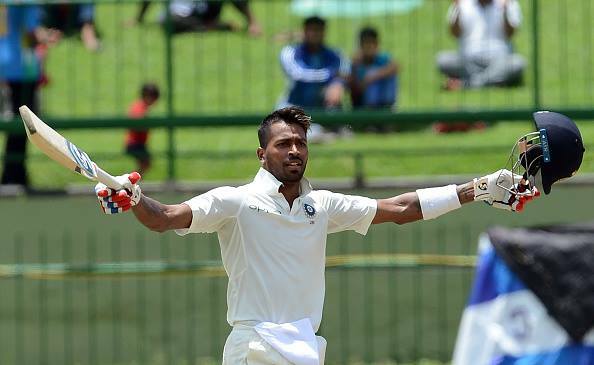 It was a different story as Hardik Pandya registered his maiden hundred in first-class cricket taking the total to 487. Hardik put on 62 with Kuldeep Yadav for the eighth wicket and 66 with Umesh Yadav for the last wicket. During that epic innings, he hoisted Malinda Pushpakumara for 26 runs 2 fours and 3 sixers eclipsed 24 runs scored by Sandeep Patil off Bob Willis in Manchester in 1982, and by Kapil Dev off Eddie Hemmings at Lord's in 1990. Recall that Sandeep scored 6 fours in a 7 ball over and Kapil struck consecutive 4 sixers taking India out of the danger of follow-on. Today’s performance of 7 Sixes hit by Hardik is the joint-second most in an innings for India. The record is held by Navjot Sidhu who hit eight against the same opposition in Lucknow in 1994. Sehwag also hit seven against Sri Lanka at Brabourne in 2009 as did Harbhajan Singh against New Zealand in Hyderabad in 2010. These are tempting to compare him with legendary Kapil Dev – style is there and he has to score consistently to make that comparison real. Today he scored 107 - in the first session of the second day. He became the first India player to score over 100 runs before lunch on any day of a Test. The session, however, was extended by 30 minutes as India were nine-down. Nice write up. Thx for bring back college days cricket seasons in our memory lane.